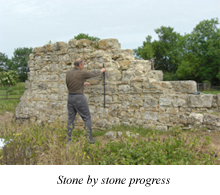 During the summer of 2009, members of the Historic Buildings Group, under the excellent supervision of Tim Upson-Smith of Northamptonshire Archaeology Service, carried out a drawn survey of the standing remains of St Peter's chapel, which lies within the deserted village of Quarrendon Leas. The medieval church of St Peter was intact at the beginning of the 19th century but is reduced to a ruin today. The chapel is important because of its historic significance, having been restored in the late 16th century by Sir Henry Lee and formerly containing his tomb, together with that of his wife Anne Vavasour. The chapel is known to have been in existence by the 12th century and was an important element of the site from the medieval period down to the 17th century. 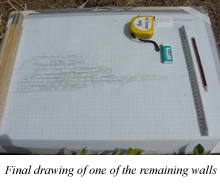 The team carried out a stone-by-stone drawn survey of the two remaining walls of the building and the drawings have now been incorporated into a document recording the current condition of the site. This report will be used to inform future decision-making, particularly as regards the preservation of the remains and its presentation and interpretation for the public.